So I was a dope and was trying to clean out my GPS and deleted the firmware off the unit. I spoke with Magellan awhile ago, but they never helped me resolve the issue. 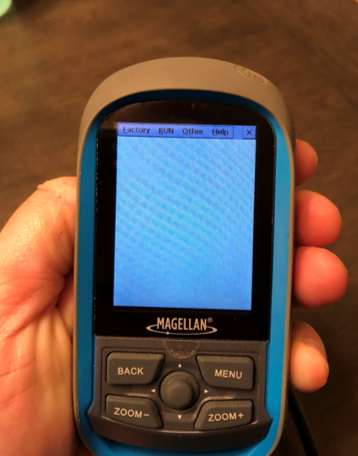 I downloaded the firmware update from the Magellan site; however, when I power on the unit and connect it to the computer, I do not get the option to "Connect to the PC." Therefore, I cannot install the update. I've searched all day and found one promising forum conversation, but that too was not working. Any ideas how I can get the firmware installed? I have another email into Magellan support, but thought I would check here too. Attached is the picture of what I am looking at. You may have deleted some critical system files, but you can't delete "the firmware." You got it to that stage, can you perform a factory reset from the menu at the top? That may replace the files that you deleted. Does the Explorist 110 have an SD card slot? If yes, that will be how to get a new firmware file to install to the device. You'll need a microSD card and a card reader (and probably an SD adapter to fit into a full SD slot if your reader doesn't take micro SD directly). No SD Card slot unfortunately. Ok. so I have the firmware then. I just don't have the software load that came with it. Whenever I hit any of the menu functions, it just goes back to that screen. Those functions, except for Help and About are useless. hmm. Well, we'll keep trying. There are a few magellan users on these forums. But if push comes to shove, switching over to a Garmin wouldn't be the worst thing in the world. Thanks Mineral2. I was actually contemplating that. What GPS would you recommend? Any of them, really? It really depends on how much you want to spend and whether you prefer a touch screen or buttons. Thanks. Ended up getting a Garmin GPSMAP 64s. I started playing with it today and I am liking it so far. Thanks for the help again.